Pictures and infomation on canals that we have cycled on. From Audenshaw to Diggle, via Ashton U Lyne, Stalybridge and Mossley. We rode along 3 parts of the canals above. We started at Audenshaw, near where I live, then we followed the canal to Portland basin in Ashton-U-Lyne. At this point you can either carry on via Stalybridge to Diggle, but we took the canal off to Marple via Hyde and Woodley. 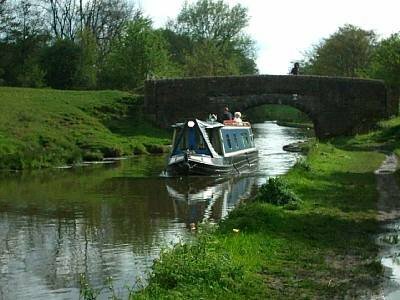 At Marple we had the choice of taking the high peak canal on to Disley, however we took the Macclesfield canal and rode as far as High Lane (near Disley). We rode back via the old Manchester to Macclesfield railway (Middlewood way), and then back on the canal from Marple back to Denton. The pages concentrate on the canal route, you dont have to follow our route, but can take in easy chunks of this route. The route is know as the Cheshire ring, which is 97 miles in total! Our ride covered 23 miles. Click Here - for a full description of the route, including pictures and description. We hope you are able to cycle some or all of this route. Page built 9th May 2005. Manchester to Ashton Canal and Stockport Branch. This is looking at part of the Manchester to Ashton canal. Specifically the Stockport Branch canal that used to run through Gorton and Reddish. At the Gorton end you can follow the original route of the line, as it has been converted in to a pathway. The canal through Reddish has mostly been lost to re-development. Recent works on the Fallowfield loop has also been continued on the Stockport canal branch. New signs have been placed, along with improvements to the path and access. There is quite a bit of industrial heritage to be found, and its also a good path to ride your bike on. The first draft of this page is only basic - we hope to add more information very soon. Click Here - for a new page looking at part of the Ashton to Manchester canal, specifically the Stockport Branch (via Reddish). Version 3 - 2 new pictures added. 19th June 2005.